Pura Vida Body & Mind Spa now offers a special approach to facial rejuvenation that creates beautiful results. 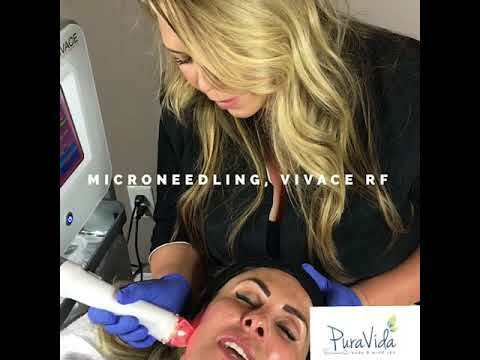 Using the latest in robotic, radiofrequency (RF) technology, the Vivace system provides us with the tools to amp up the effectiveness of our microneedling procedures. While RF treatments have been around for many years and are well known in the cosmetic industry for improving skin tone, texture, and laxity, the Vivace system is different. Vivace adds heat and red (and/or blue) LED light to robotic precision microneedling. Where normally this would require three separate treatments, Vivace has combined them all into one. This combination encourages more production of collagen and elastin in the deeper layers of the skin (dermis) resulting in a tighter, smoother surface of the skin. This therapy can also be used in conjunction with platelet-rich plasma (PRP) application to optimize your results. At Pura Vida Body & Mind Spa, we strive to generate firmer skin, a smoother texture, and a glowing complexion for all of our guests. "Amanda is amazing! I just had my second I'll treatment and am thrilled with the results. When you go for treatment, ask for Amanda!!!" Before your procedure, we will numb your skin with a topical anesthetic cream. Numbing takes between 30 – 45 minutes. Depending upon your desired results, your skin’s health, and other factors, we will set the Vivace device on the appropriate settings and make adjustments as needed throughout the treatment. In short passes, the RF energy and LED light (blue or red depending on skin needs) will be transmitted through very tiny, sterile, gold-plated micro-needles. This will make micro-injuries in the skin, which also creates a healing response within the skin. This is sometimes referred to as collagen induction therapy. New cells begin to grow as the skin heals, leaving the top layer feeling and looking smoother, brighter, and rejuvenated. While this procedure is often performed by itself, combining this advanced method has allowed us to optimize the results for our patients. Immediately following your treatment, we will apply a recovery mask and growth factor serum. If you opt to have PRP added to your Vivace treatment, it will be applied first, followed by growth factor serums. It is important to refrain from exposing your skin to the sun for at least 12 hours after this treatment. You should also abstain from strenuous cardio exercises or put cosmetics on your face for 12 hours after your appointment with us. The Vivace technology will be guided across the skin, repeating the process until the desired results have been reached. You should expect small pinpoint scabs to appear 24 – 72 hours afterward, which will naturally shed when the underlying micro-injuries in the dermis have healed. Results become visible as skin recovers over several weeks after a microneedling with RF session. Optimal results usually necessitate 3 – 4 treatments about a month apart. For a few hours, you may experience redness, pinpoint bleeding, slight swelling (inflammation of the skin), heat within the skin (like a sunburn), and crusting/scabbing of the skin after the treatment. These reactions are all normal. If you have questions about your progress or have a side effect that is excessive, please call our office for assistance. Every person reacts differently. We will give you a personalized aftercare treatment packet and specialized products to put on your skin as instructed. If you are seeking to lessen the appearance of aging or sun-damaged skin, as well as diminish wrinkles, laxity, or acne scars, RF microneedling is a great treatment with proven results. In combining RF skin tightening and microneedling, this outstanding skin rejuvenation process has increased in popularity and continues to be a top-rated, minimally invasive treatment for our Jacksonville, FL patients. 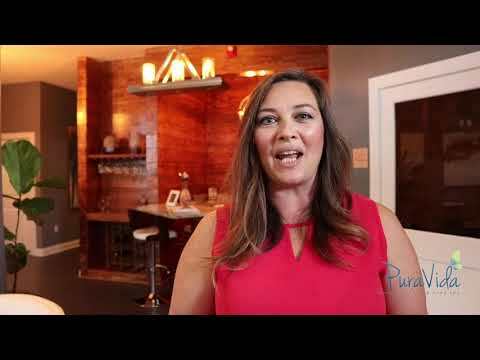 We ask you to call Pura Vida Body & Mind Spa to discover more.